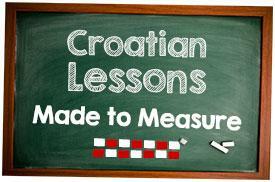 Školica has been offering online one-to-one Croatian lessons since 2012. We can teach in English, German, Spanish or French, with prices from €19.50 (approx. US$21.90)/hour. All our teachers have studied languages at university. Lesson materials and homework are prepared to suit your learning needs. Book a free trial lesson now to try it yourself! Online lessons are always live, so you'll agree a time in advance with your teacher. Taking part in a lesson is as simple as opening a website in your browser, there's no need to install any additional software. Lessons are tailored to each individual student and can be taught in English, German, Spanish and French. All of our teachers are native Croatian speakers who studied languages at university level. We're happy to help you plan the number and frequency of your lessons. Lesson times are flexible and prices start from €19.50 (approx. US$21.90) per hour, depending on the number of hours booked.